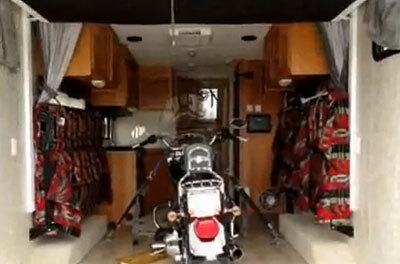 Toy haulers are popular type of RVs, especially for those with adventurous spirit. Due to large cargo space they provide means to travel with favorite “toys”. ATV, motorcycles, bikes but also winter equipment like skidoos, skies and in general all kind of gear you may need when in wilderness. At the same time, they usually provide also well-furnished living area with kitchen, sleeping and eating area. The truth is that Toy Haulers allow you to go for vacation into the nature (wilderness) taking with you most of what you keep in the garage or garden shack. Energy toy haulers provide large space for cargo as wheel wells and fuel fill have been removed from the interior floor space. The product is popular because of its lightweight and an array of standard features. Energy toy hauler is fitted with LCD TV, electric beds with Futon-style mattresses, 30 gallon fuel cell, generator prep, Gear Net cargo storage system, porcelain toilets, residential wood grain cabinetry, larger holding tank capacities and Campside Outdoor Theater. Camping with a Energy toy hauler has its own charm as the vehicle is packed with more standard features than any of the competitors. There are four models in the Energy range, namely 235FBWE, 257FBSWE – NEW, 280LSABWE and 300FBSWE. The typical floor plan includes 60 x 74 bed in the front, with overhead cabinet and closets on both sides, Pantry, dinette and sofa in the middle and bed in the rear. The ramp at the back provides ample space for cargo. Energy toy haulers are produced by Keystone RV Company based in Goshen, Indiana. 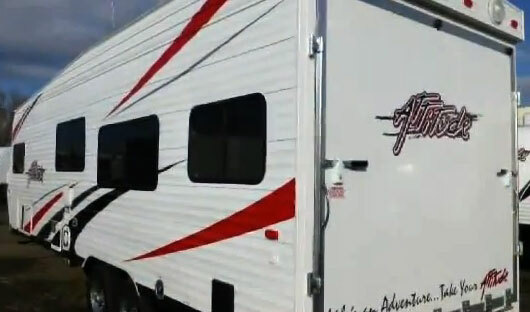 Attitude toy hauler comes with rear bed, double roll over sofas, double kitchen sink, three burner kitchen range, refrigerator, pantry, TV, wardrobe, plenty of overhead cabinets, Toilet, lavatory, shower and a queen bed. The toy hauler model comes with a generator. The vehicle sleeps six persons. The colors are: exterior White and interior Brown. 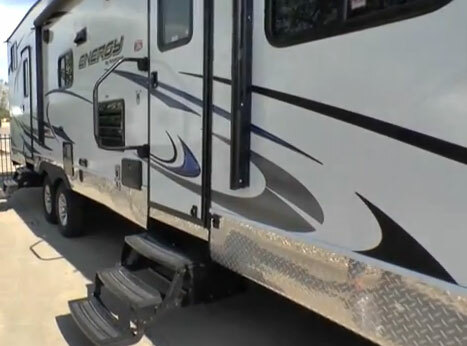 This new 2014 Forest River model comes with a lot of features while providing more than enough space for cargo. Stealth model has rear electric bed with futon mattress, front queen bed, flip sofa, two captain’s chairs, pantry, refrigerator, medicine cabinet., wardrobe, nightstand, toilet, , lav., tub, double.kitchen sink, 3-burner range, microwave, many overhead cabinets, outside kitchen with single sink, and much more. Available options may include sofa slide. This model sleeps five persons comfortably. 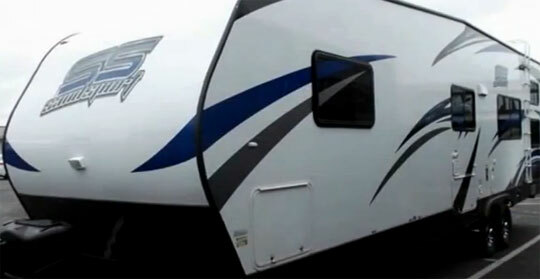 Sandsport toy haulers are manufactured by Pacific Coachworks, Perris, California. Sandsport has a wide number of variants. 24 FBSL is quite a popular model in the Sandsport range. The model features a rear 7' ramp door. It comes with 2 rear electric beds with bottom bed turning into a sofa, overhead cabinets, 2 chairs with overhead storage, 3 burner range, microwave, double kitchen sink, refrigerator, pantry, front queen bed with wardrobes and some other standard features. This model is manufactured by Jayco based at Middlebury, Indiana. As the name implies this model makes hauling the toy cargoes a breeze. The model weighs 3,765 pounds everything considered. The attractive features include aluminum rims, patio awning with adjustable pitch and rear stabilizer jacks, to name just a few. The interior features shadow décor. Octane Super Lite features a versatile floor plan that doubles as a spacious garage and a feature-filled living area. The cargo area boasts floor-mounted, tie-down D-rings with an integrated hinged spring-assist ramp door, while the kitchen comes complete with 2-burner range and a 5 cu. ft. refrigerator.